As I've mentioned many times, food associations and products usually have recipes on their site. California Almonds (Almond Board of California) has many great recipes, but this is my favorite recipe on their site. 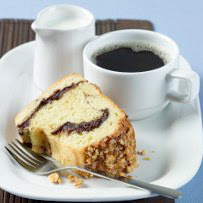 I love coffee cake, and there are so many varieties. Cream butter with 1/4 cup sugar and salt. Dissolve yeast in warm water, add a pinch of sugar; let stand until bubbly. Add milk, yeast, eggs and flour to creamed mixture; mix well. Cover and let rise in warm place 2 hours or until mixture doubles. Meanwhile, combine almond paste, remaining 1/2 cup sugar, cocoa and almond extract; set aside. Generously butter an 8-cup tube mold; sprinkle with almonds and 1 Tbs. sugar. Stir dough down and place 1/3 into prepared mold, building up around tube. Sprinkle with half of almond paste mixture. Repeat, ending with dough. Seal edges of dough to pans with floured hands. Bake at 400°F, 40 minutes. Remove from pan; cool. What a beautifully elegant cake and it sounds so delicious too with the marzipan. I've not really come across using yeast in a cake before, so I shall have to bookmark this one.